We from the Microsoft Dynamics NAV support team (Microsoft CSS) see an increasing number of support cases coming in related to Office 365 integration in a hosting environment. This range from the relatively new Edit in Excel feature or the relatively new Outlook Business Inbox to the more familiar Office 365 Single Sign On functionality. This blog post is intended to help you to first discuss the requirements with your customer, it may also help you to understand the difficulties. It should be relatively easy to implement these capabiltities, but since there are so many external components that require different configuration setup, we may end up in high labor intense support cases where we need to put all pieces together. This blog post will hopefully serve as a guide where we summarize all relevant documentation that is out there. Finally, we will showcase a typical environment with several Azure AD’s among some other typical scenarios. If you do now the basics, you are half way through to finalize the setup successfully. Let’s therefore look at the system requirements and the description of what the Edit in Excel functionality can do for you. All relevant documentation can be found on this blog. E.g. system requirements and the documentation about the functionality and setup. Yes, you can use a self-signed certificate. If you search for it on the Internet, there are many ways of creating your own cert. Fortunately, there is a way that avoids using difficult parameters in combination with deprecated tools like makecert.exe. Self-signed certs can be easily created, and we blogged about that in 2014 here. If you get into trouble with using / configuring a self-signed certificate, it will be your first request for help to either Microsoft CSS or to your Dynamics NAV partner. Trusted certs are recommended. Trusted certs avoid that you must ship the SSL cert to every single device and install them manually in the trusted root store. You do also need to decide about credential types. For example, AccessControlService or NavUserPassword to name a few. As you may have heard, Azure team no longer support AccessControlService. As of now, the Dynamics NAV development teams are analyzing the impact of that decision of the Azure team. At present, we do not know what and if there is an impact for us. 3. Your company consists of only one tenant, one database, etc. Just sign on and off you go. OData endpoint must be reachable for the Edit in Excel functionality to work. This does mean you need to think about security, firewalls, ports assignment and endpoints if running in a cloud environment. Also, you do need to think or make a decision if the Edit in Excel should be reachable from outside your corporate network, etc. Though not exceedingly difficult to configure, our documentation lists that you need to have access to Azure AD. We are currently seeing a high incoming support call volume related to the relatively new Edit in Excel functionality that was first shipped in Dynamics NAV 2017. These support request are considered high labor intense support requests where we do require the partner or customer to test a lot themselves to find root cause of the issues they do encounter. We do also have to ask these unfortunate partners or customers to reconfigure their environment to get things to work. Not all Dynamics NAV partners are able or allowed to access customer Azure AD’s which does make partners life not easier but more difficult. 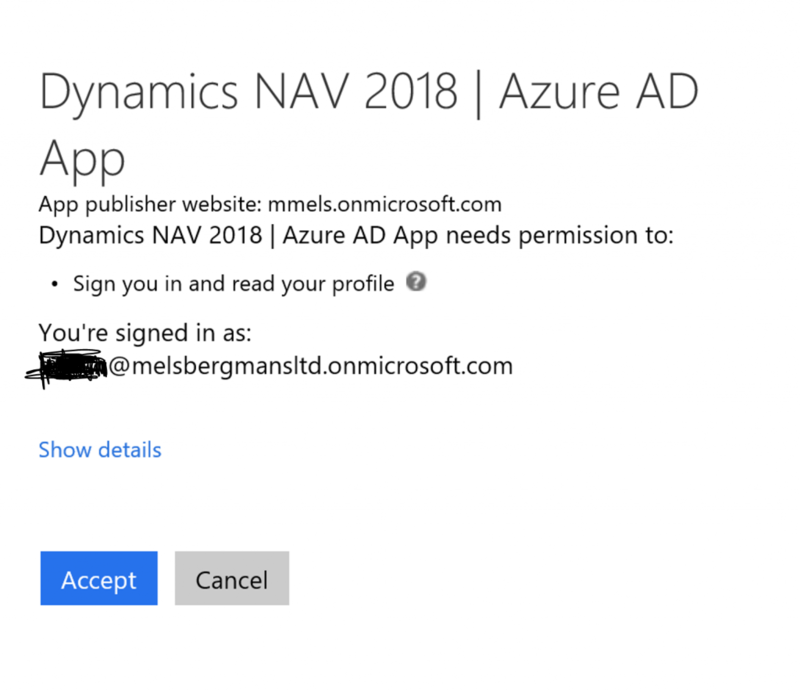 It is something to discuss with your customer proactively, that the Dynamics NAV consultant does require access or does need someone to help him creating the Apps on the Azure AD. This add-in provides users with Dynamics NAV customer or vendor information in Outlook emails and calendar appointments. It also enables users to create and send Dynamics NAV business documents, such a sales quotes and invoices to a contact. To support these task, the add-in adds actions to the Outlook ribbon, in the Dynamics NAV group. When a business document is sent as an email, this add-in provides a direct link from email to the actual business document in Dynamics NAV. The add-in adds a Document Links action in the email header, which a user can select to display the document. We’ve learnt from incoming support requests that the PublicWebBaseUrl is not filled in correctly all the time. We’ve also seen some support cases where a highly secured environment could not access all required components that are stored on the Internet needed for the Outlook Business Inbox. A Fiddler trace did show where the environment was too secured and what should be opened so that the Business Inbox could work. In some scenarios we saw that a self-signed certificate limited the full functionality of the Outlook Business Inbox. These are things to consider when deciding what type of SSL cert, you are going to buy. One of the other requirements is that you have a supported release of Excel for the Edit in Excel functionality to work, this can be cloud based or OnPrem (desktop) release. If you do not have yet an Office 365 subscription or Office 2016 OnPrem release, then you can get yourself a trial account here. 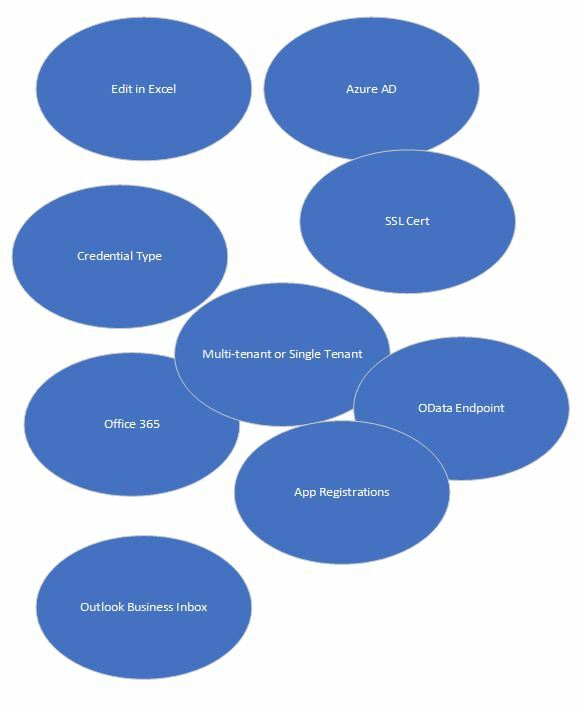 Note that some of these Office 365 subscriptions also have support for Azure AD. The one in the link is an E3 subscription plan (trial) which does also include the Azure AD. With an Office 365 E3 subscription plan, there is no need to also get an Azure AD subscription as well. In the below scenario description, I will be using my MSDN subscription (mmels.onmicrosoft.com) for the Azure AD only and I will be using a separate Office 365 subscription (melsbergmansltd.onmicrosoft.com) for the second Azure AD needed for the authentication of the users. In the hosting scenario, I do need two Azure AD’s to demonstrate. Complicated? No, not really but it should be part of your discussions of requirements you will have to go through with your customer. There may be customers out there that do only require a single tenant environment. This is fine, of course. It has been like this for years. There may also be customers out there that do really require multi-tenant environments. Every single customer still have their own business requirements. These different requirements do require different setup. They do all want this functionality to work with the least administrative work. Your company consists of only one tenant, one database, etc. Let’s discuss the first scenario to start with. 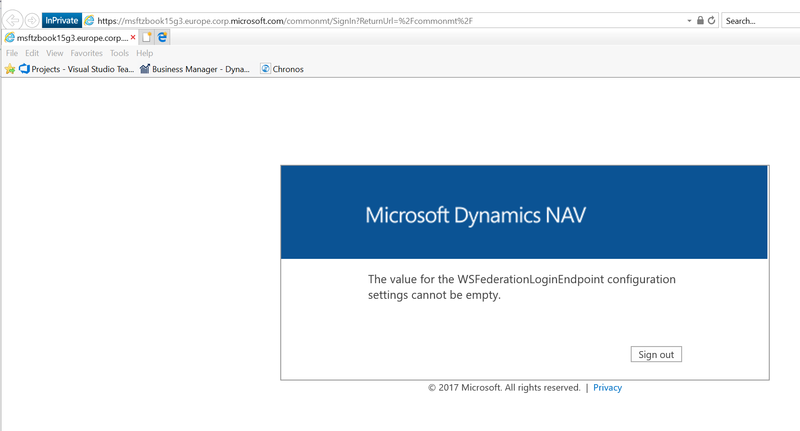 NOTE: In in Dynamics NAV 2018, PublicWebBaseUrl ‘\WebClient\’ was deprecated. In Dynamics NAV 2017, it is still in use. There is a Windows User that can logon to all tenants. NOTE: Azure team no longer supports AccessControl service. At the moment of writing this blog, we do not know what this does mean for our own O365 SSO configuration. We should also set the Management Port. Press Create and then select the Dynamics NAV 2018 | Azure AD App to display the details of it. Copy the value: Application ID value and paste it into Notepad. Now click Properties in the right-hand side. Copy the App ID URI value and paste it in notepad. Ensure that Multi-tenanted is set to Yes. Press Save to save any changes you did make. Now click on Reply URL’s. If you somehow run into troubles, before filing a Support ticket, please generate a copy of the manifest file as a Microsoft support engineer will ask for it. We may also ask you for the customsettings.config file and application event log file. 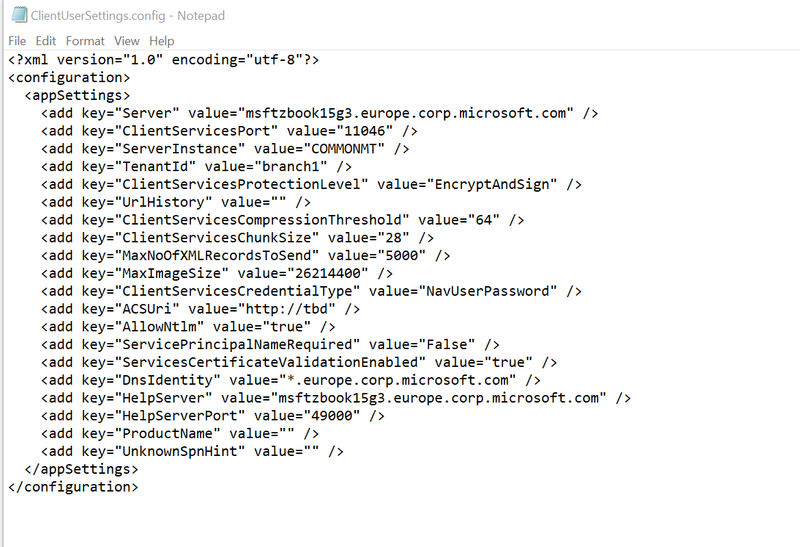 Of course, the relevant web.config file or navsettings.json file should also be sent to the Microsoft support engineer. We can then directly look through the several configuration setup details. Last but not least, we will have to restart the instance. We should now be able to start the WebClient with O365 SSO after running an IISRESET (some settings may be cached). After accepting, we are able to logon. The App Registration Dynamics NAV 2018 | Azure AD App can be adjusted so that property Multi-tenanted is set to No. In the described environment setup, we can now only logon with users that are defined in Dynamics NAV and only belong to tenant mmels.onmicrosoft.com. Here scenario 2 does apply with some adjustments. There is no need to create users in branch2 and branch3 (simply because they do not exist as this is a single tenant environment). We also do not have to run the exercise to create a multitenant environment. We can however still use the created application that did apply to scenario 2. If you like this blog posting that does come out of Microsoft Dynamics CSS, please consider liking this blog posting and / or add some comments how we can improve. In the comments you can also drop any questions you may still have and or suggest topics for other blog postings.